I got the idea for this quiz from an About.com article. I changed a few definitions and categories. 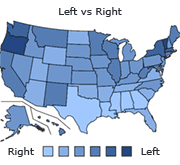 For example, the author had "civil libertarian" and "fiscal libertarian" as two types of libertarians. I don't think someone who is a civil libertarian / fiscal socialist is a libertarian; nor is a civil fascist / fiscal libertarian. The categories I kept from the original article were Anarcho-Capitalist, Classical Liberal, Geolibertarian, Neolibertarian, Objectivist, and Paloelibertarian. I axed Civil Libertarian and Fiscal Libertarian, and altered Minarchist to LP Partisan; and Libertarian Socialist to Anarchist. What is your stance on taxes? Taxes are a necessary evil, but we are in a fight for survival against Islamo-Fascism! We need a big military! What is your view on the proper role of government in education? Public schools are a great place to recruit new soldiers for the war against Islamo-Fascism! How do you feel about the military? What role should government spending play? None. The government should be abolished. Very minimal on defense and other necessary and vital functions of government. As little as possible, but we need the government to spend trillions on defense in the name of freedom! How important is the Constitution? What are your feelings on immigration? What are your feelings in regards to corporations? What are your feelings on abortion? What are your feelings, RE: the Libertarian Party? Which of the following candidates would you most like to see as president? Are you a Libertarian? Find Out! by Jack B.
Quiz topic: What Kind of Libertarian am I?